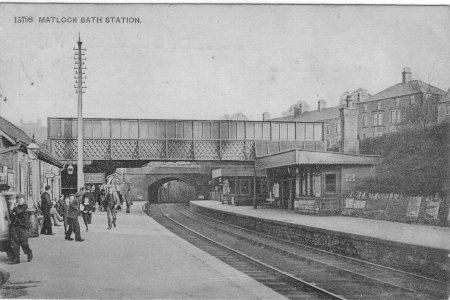 Posted 1905, Matlock station (not Matlock Bath). Looking South. Taken 1968. Looking South towards Matlock Bath. Taken 1960's. Looking North towards Darley Dale. Riber Castle can be seen on the left skyline. So this must be looking SE from Matlock station, it can't be looking North from Matlock Bath station as the postcard title reads. 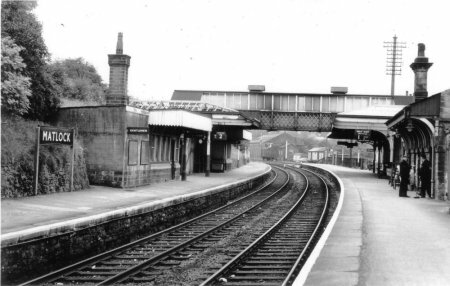 The less elegant station buildings and bridge also point to Matlock. This is Matlock Station. 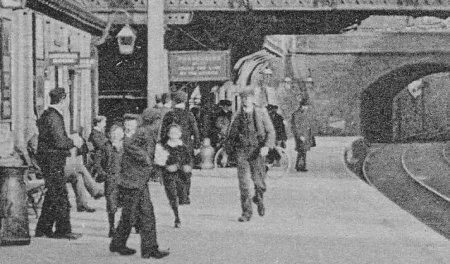 The footbridge is gone, the houses to right are on Snitterton Road or Smithy Lane as it was known in 1847. The buildings at the station to left are still there, Peak Rail having their offices there. The waiting rooms on right have gone as I think as the second line, unless its under all the weeds. You can see Riber from Matlock Bath station if your neck is about three hundred foot high to get over High Tor. 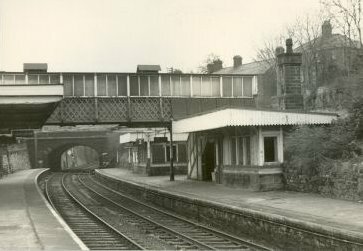 Definitely Matlock- Matlock Bath never had a waiting room at the other side of the track and the bridge was never enclosed as in this photograph, also the houses are the ones going up Snitterton Road, there are only fields at the back of Matlock Bath Station. Riber Castle cannot be seen from Matlock Bath station. - hope this answers your query. Thanks for putting this photo on the list. My gt. grandfather, Thomas PALING, was a guard on this line in 1860s and I am always interested to see anything that would show me what the line used to be like. I know the buildings as they are today but had difficulty in imagining what they looked like when the line was in use.